We added an update to this article, so be sure to read the final part before rushing to the official order page. Smartphones reached out to be a fundamental part of our everyday life. 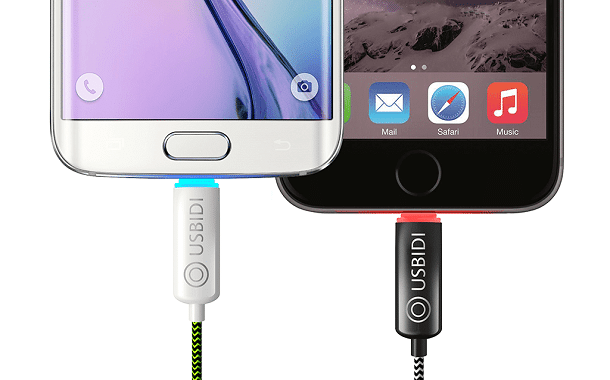 UsBidi is the ideal cable for charging, which takes care of your phone battery. Naturally, here comes the question: What can a simple charger do? As you all know the Apple company tells us to remove cases (phone accessories) while charging, and the Samsung company tells us to unplug when the phone is fully charged. As you see here are two of the main reasons for which the UsBidi charger has been created. If you are interested in purchasing the UsBidi charger know that it is available both for iPhone as for Android from February 2016. If you reserve it right now it will cost you just $16, but if you wait till the official launch you will pay $36. UsBidi supports 2.4 A and has a nice design, superior to the currently existing ones on the market. It features intelligent technology, a built-in printed circuit board (PCB), that reads when the phone is fully charged and “cuts” the energy supply permanently, as if it is unplugged, becoming extremely useful for those who forget their smartphones plugged in all night. This auto-unplug function saves your phone’s battery life and also conserves the energy. Usually, if the battery remains at charging for several hours, there should not be a problem. In the past few years some batteries appeared, that do not change their parameters, in case they remain connected to the power supply, not even if they are fully charged. However, everyone recognizes that the system gets heated and the heat brings no benefits to the batteries. When you plug in your UsBidi into an USB port know that the charging speed will double. This happens because UsBidi has a touch switch to stop data syncing, so that the power will be directed just for charging. If you’re into all the latest gadgets, design and good-looking stuff, the UsBidi is for you and be sure that you will love it. You can purchase it in many colors, blue, black, green, and different lengths, 1ft (0,3 m), 3 ft (0,9 m), 6 ft (1,8 m). The UsBidi charger has at one end a LED which indicates the charging process and another practical feature is its magnetic ends for a tidy hold. • The MFI certified Lightening version for Apple devices. • For 100 UsBidi chargers you pay $1600 in preorder and $3600 after the official launch. Now you have the possibility to consume less energy and also save the battery’s life, to last a lot longer than before ever. Should the average working Joe get an UsBidi charger? The truth of the matter is that especially if you’re a tech and gadget enthusiast, you’ll have a pretty expensive smartphone. Most people don’t afford getting new expensive smartphones each time the one they own gets broken in any way. That’s why it will be a great idea to get the UsBidi, to make your smartphone last longer, at least in terms of batery life. The price itself won’t set you back too much, especially if you order it within the preorder period, so don’t waste any more time and get yourself a cheap but very useful present! The launch date has passed for this product and we wanted to see how everything is going. We found out that the launch date has been pushed back over and over again, but some of the people that preordered, already got their USBidis. Although we weren’t able to buy this product yet to test it ourselves, the comments from USBidi official facebook page are pretty negative. We encourage you to do your own due diligence before you buy an USBidi to make sure you’re spending your money wisely. Some users of the USBidi report receiving fewer products than they ordered, while others say they got broken or non-working USBidis. We’re not going to throw terms like scam or low-quality at this product, as it is pretty new, although some people already do. Instead we ask you to check USBidi official facebook page and do any other research you can, before ordering. If their products don’t receive better feedback within the next few weeks, we will be forced to stop linking from other articles to this one. How to buy us bidi charger for iPhone 6 please help me. How Much Does an American Girl Doll Cost? How Much Does Cremation Cost?